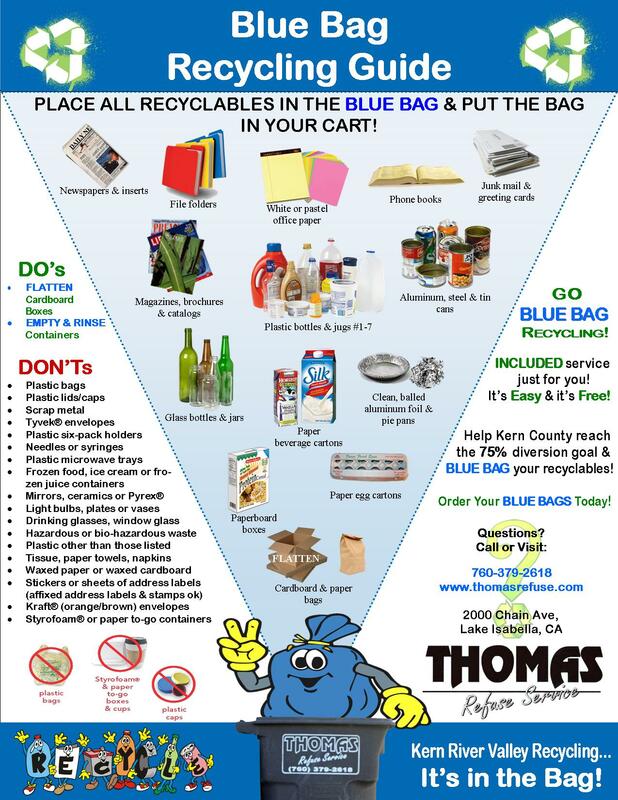 BLUE BAG RECYCLING NOW AVAILABLE IN THE KERN RIVER VALLEY! What is BLUE BAG RECYCLING? Free and easy 36 gallon blue bags for our commercial and residential solid waste custoemrs that allows you to put all of your recyclables into your trash cart or bin. Who is the recyclng service for? The recycling service is for all of our current residential and commercial customers. I already recycle ALL of my stuff, so I don't need a recycling container. While there are a few who are diligent recyclers and recycle all of their junk mail, cardboard, paperboard, plastics, glass, etc., many people think of recycling as something only pertaining to CRVs (plastics, aluminum and glass). However, almost 75% of your so called trash is actually recyclable. Download our brochure for all of the items that you can recycle and keep out of our landfills. How often do the blue bags get serviced? Blue Bags are put into your trash cart or bin and are serviced on the same day. Does it cost money to have recycle cart service? Nope! It's INCLUDED in your trash service. How do I get more bags? Click here to see our Blue Bag Recycling Guide.